If you remember, one of the first times I went to Melbourne, I didn’t like it. I thought it was crowded and lacked a variety of food. I still think it’s very crowded and a lot of people spend more time looking down at their phones rather than looking at where they’re walking. Some people are pushy and rude. But I think that’s the same for all big cities. However, I do stand corrected. I had some amazing food this time around. Perhaps because I wasn’t so new to the area anymore or perhaps because I didn’t listen to MJ and go to the dives he liked to go. My kids are fussy eaters (I wonder where they get that from!) but we made it a point that we all had to try different food. We couldn’t eat anything we could have at home. The only exception to that was when we had breakfast at Subway in the Melbourne airport on our first day. We needed something quick and that was the only place that didn’t have any lines (queues). As we walked around, we saw so many interesting places to try but we only had 2 days so we had to be selective in what places we were going to experience. We tried Nando’s for the first time. Yeah I know, it seems everyone’s had Nando’s but we honestly hadn’t as it’s nowhere near us back home. MJ had the Paella with the mild sauce. I had the Classic Pita with the Lemon and Herb sauce. LJ had The Hot Duet with BBQ sauce while CJ had the Grilled Tenderloins with BBQ sauce. We all shared a Cheesy Garlic Mini Pita. And it was all a success. We enjoyed our food thoroughly. MJ couldn’t finish all his paella because it was so spicy. He loves spice but this was beyond bearable for him. The mild sauce was fine. The spicy rice was not! All in all, it was great and we definitely would go back to it again. The Pancake Parlour is always a treat! It’s like the Australian version of IHOP. Man, it was delicious and filling! I had the Farmer’s Breakfast but I didn’t eat the hash browns – LJ ate them instead. I didn’t realise I could order the Traditional Breakfast and get bacon until after I had ordered! Oh well, next time! The kids loved their breakfast. When would I let them have ice cream with their pancakes for breakfast?? 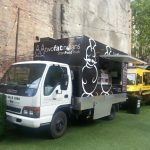 But my favourite place was located right across from the hotel – The Food Truck Park. The Philly Cheesesteak (with double American cheese) was gluttonous delicious and reminded me of NJ (which was nice since it was Thanksgiving)! What would have made it perfect if it had green peppers (capsicum) but even so, we all LOVED it. And they had soft pretzels with mustard! We ate al fresco and the kids played ping pong (table tennis) while we waited for the food to be ready. One of the men from Two Fat Indians Food Truck joined us in playing as well! 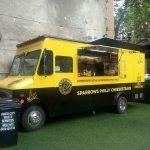 We wanted to have Sparrow’s Philly Cheesesteaks again for dinner the next night but they weren’t there. Little did we know that they had a restaurant near the museum where we had just come from. We only found that out while we were waiting in traffic to go back to the airport! Next time we go to Melbourne, we will definitely be hitting those Cheesesteaks as well as trying all the other wonderful places we saw! I’m glad that we had decided that the trip would consist of new foods rather than the same old chains we could go to at home, if we wanted to. It really opened up the Melbourne experience for us. Keep a look out for my next post on what we did in Melbourne. 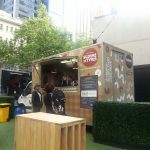 Share the post "Melbourne food"